This book offers a broad perspective on the field of cognitive engineering and neuroergonomics. It covers emerging practices and future trends towards the harmonious integration of human operators with computational systems. The book reports on novel theoretical findings on mental workload and stress, activity theory, human reliability, error and risk, and neuroergonomic measures alike, together with a wealth of cutting-edge applications. It describes key advances in the understanding of cognitive processes, including mechanisms of perception, memory, reasoning, and motor response, giving a special emphasis to their role in the interactions between humans and the other elements of a computer-based system. 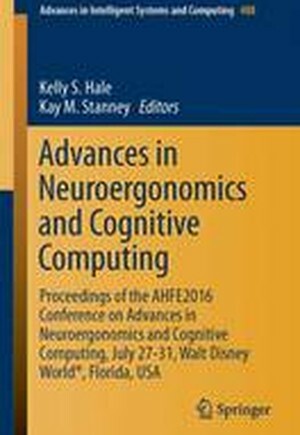 Based on the AHFE's main track on Neuroergonomics and Cognitive Engineering, held on July 27-31, 2016 in Walt Disney World (R), Florida, USA, the book provides readers with a comprehensive view of the current challenges in cognitive computing and factors influencing human performance. Influencing Design with Cognitive Engineering and Neuroergonomics.- Cognitive Computing.- Physiological Monitoring and Interaction.- Theoretical Advances in Cognitive Engineering and Neuroergonomics.- Assessing Cognition and Performance.